If your family is like mine, pasta of any kind is always welcome at the dinner table. This creamy, cheesy, easy-to-make recipe is no exception! 1. 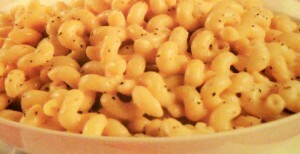 In a 1-1/2-quart casserole, combine the soup, cheeses, milk and pepper; stir in the cooked pasta. 2. Bake at 400 degrees F. for 20 minutes or until hot and bubbly. Makes 4 servings. Hi Emily, In my family cheese is always a hit. This sounds delicious. My grands would really eat this up in a flash. Smile.